Your education has likely left you in the dark about Aboriginal culture. And now you hesitate to join discussions or continue to feel guilty about not knowing what happened in the past. Meet Cherryl. She used to belong to the majority of Australians who know too little about Aboriginal people. "I am an education worker in a secondary school and often look for information as I'm very committed to having good knowledge of Aboriginal people, culture and society and the issues surrounding them. I used to spend a lot of time to get up to speed with issues that I couldn't readily find in the media (mainstream or not). Our library doesn't always have the information that I know is out there. And so very few people know anything about the Aborigines in Australia! One day, in frustration, I did a Google search and found Aboriginal Culture Essentials. Since finding the book my awareness and understanding about Aboriginal culture has increased heaps! I have found countless resources which I've used in many of my assignments. It's invaluable to my staff who come from mainstream Australia and helps clear the many myths non-Aboriginal Australians have. Thank you so much for opening my eyes and mind. This makes my work so much easier,I would be lost without this resource. You are making a lot of otherwise obscure information, data and their sources available. It has helped me immensely in growing my understanding which is vital for my role in the culturally diverse team here, and me personally." Aboriginal culture is my passion. Since 2006 I’ve written hundreds of pages about Aboriginal culture, many of which are long and detailed, and also answered questions of my subscribers. But I realised that many of my visitors also need a quick introduction into Aboriginal culture which answers their main questions fast. 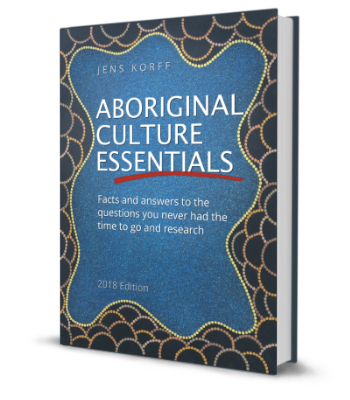 That's why I created Aboriginal Culture Essentials – essential answers you need to know about Aboriginal culture today in a handy reference that saves you hours of research. Aboriginal Culture Essentials isn't just another ebook. I've designed it to be easily readable, a visual feast for the eye, and interactive and fun to consume – things you wouldn't find anywhere else. Students and teachers trust my content and use it for their assignments and teaching. It has been published in School News Australia, Geography Bulletin (The Geography Teachers Association of NSW), Ethos (The Journal of Social Education VIC) and other online and print publications worldwide. The National Library of Australia has found my material “to be an important component of the national documentary heritage” and archived it in the Pandora Web Archive it helped establish. Every month more than 170,000 people are looking for answers on my website. More than 11,000 benefit from information I only share with my subscribers, and each month about 4,500 people view answers I've shared on Quora. Like you I originally just wanted to know more and started asking questions. Aboriginal Culture Essentials is based on the thousands of hours that I've now invested to compile content for Creative Spirits. It condenses knowledge into manageable chunks. My infographics are one way of showing content in a comprehensive, simple and easy-to-understand way. My audience loves them, but the infographics are designed to only cover one idea. Aboriginal Culture Essentials brings this concept to a range of important and popular topics. Finally a resource that doesn’t take long to read, is easy to digest and offers you many ways to have some fun exploring. Contemporary answers to your questions? Engaging and fun to read? Aligned to the Australian Curriculum? Further links if you want to know more? For once, enjoy educating yourself and feel better about being up-to-date on the important aspects of Aboriginal history and culture. Are you open to learn & have fun? What topics are in the ebook? With Aboriginal Culture Essentials you get both, the obvious and the hidden topics, so you feel less ignorant and better informed. Obvious topics are the most popular ones, searched for a lot on the web, and mentioned frequently in the responses to my pre-launch survey. You'll get the answers many others are also looking for. The hidden topics are important to know about but not always on people's minds. 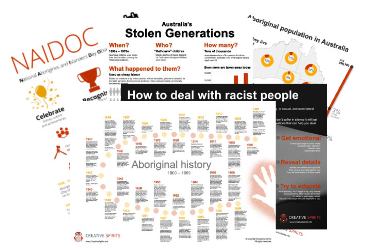 Topics that come up time and again in the media, in exams, or are at the heart of what Aboriginal people care about. As a result you get both popular and important content and are left with a well-rounded picture of Australian Aboriginal culture today. Stolen Generations, one of the most popular topics that had huge effects on Aboriginal Australians and is still continuing today. Self-determination is a topic that’s important for Aboriginal people, and many protests have this, and a treaty, in mind. Land and Aboriginal people are inseparable and it’s vital to understand this connection and the meaning it has. Incarceration rates throughout Australia are in crisis and need to be understood to see the connections to other topics. 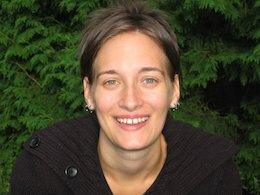 Aboriginal health is often at the tail end of other disadvantages. A look at the current situation allows you to understand the diseases and their effects have on people. Current population statistics might clear the odd stereotypes people hold. Identity is what many Aboriginal people struggle with, and sometimes they use Google to find out. Art: Discover the multifaceted ways Aboriginal art exists beyond dots and dances. In politics it is important to understand how certain legislation has impacted on Aboriginal lives, both for the better and worse. A short history lesson introduces you to the most important events of the early 20th century, the most popular time period people investigate. This digital book is different. I've enhanced the text with fun bits that keep you motivated, focused and entertained, and maybe you just want to start with checking out those. Answer quizzes, try the crosswords, browse statistics or read short breakout stories. Feeling adventurous? How about a treasure hunt? These nuggets are designed to whet your appetite and integrate the text they accompany. With the ebook you get a comprehensive list of all days of the year that are significant to Aboriginal people — Invasion Day, Mabo Day, and lesser known days such as John Pat Day. 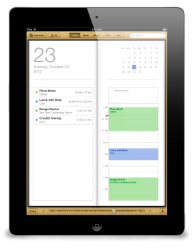 Read how they came about and why they are celebrated today, then add them to your calendar with a few clicks. Local Aboriginal Land Councils are a go-to place for many questions only Aboriginal people should answer. But which Council is responsible for your area? Use this list to find out and have a yarn with them when you need answers to culturally sensitive questions. I know how textbooks can be impersonal and dry to read. That's why I've glued together all chapters with an overall story. Meet Anthony, a fictional character who you'll be chatting with in his gallery. He'll show you around and help you connect the dots. You can read this story just like a novel or short story in one go, without touching any of the other content. "This is an interactive, factual and insightful book on Aboriginal culture in modern Australia. The book is an engaging read for people of all ages and backgrounds." "Congratulations! A true masterpiece made with lots of love and energy." "It is a must to read this book, if you want to unterstand Australian history! I gained really good knowledge where previously I only had pieces." "Jens, your passion and dedication to the Aboriginal people of Australia is evident by the in-depth detail and passion you have put into every page of your book. An outstanding effort." "You have provided a great resource that is much more accessible to my students than the dense, academic texts out there." My e-learning products have helped more than 1,500 people since 2014. Just like all these customers before you, I want you to be completely happy with your purchase from Creative Spirits. 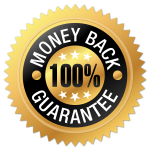 That’s why I offer a 100% unconditional 30 Day Money-Back Guarantee for this ebook. If for any reason, the ebook fails to meet your expectations please contact me by email within 30 days of purchase. I will refund the full value of your purchase when accompanied by a valid receipt. Is there a hardcopy version? No, this is a digital resource only. But I'm currently researching print-on-demand services which allow you to print and post a single copy to you. Can I use the ebook for educational purposes or add to my school library? Absolutely. I want to help you in helping others learn the facts and feel better about knowing enough about Aboriginal Australian history. Please contact me for a library license. How will it stay up-to-date? I will offer an updated version of the digital book each year. If you already own a copy and have a receipt of your purchase you can get the new version at a very discounted rate. Is the ebook well researched? You bet! I want to offer you a resource you can rely on and use confidently. I’ve used reliable sources and double-checked the statistics and facts that I’ve used for each chapter. You can use this ebook if you are a student or teacher, if you work in Aboriginal education or give cultural awareness and competency courses. You can also give it to your (new?) partner who wants to learn more about Aboriginal culture. I could write an epic article for each topic the digital book covers – actually, I already did. But excessive content would just overwhelm you and you’d walk away knowing not much more than before. By focussing on the essentials and helping you memorise them you are much better equipped than after reading a long text. Has the ebook been reviewed by Aboriginal people? From my subscriber survey I know how important it is that any Aboriginal resource is culturally appropriate and sensitive. I am currently in contact with an Aboriginal organisation with a view to culturally review the book. With Aboriginal Culture Essentials I am offering you a few bundles that package valuable assets at a great price. Hundreds of students and teachers have used my infographics for their work and in their classes. They are an excellent extension to the ebook to deepen some of the most popular topics. You'll get high-resolution and easily printable assets for your learning. I do offer a library license. Pricing is staggered and depends on the number of concurrent loans length of the license. Pay just $6.43 each week over 5 weeks for your copy of Aboriginal Culture Essentials using PayPal.